The monastic lifestyle is one of withdrawal and seclusion from the world for the purpose of devotion to prayer, spiritual study and work. The word “monk” has its origins in the Greek “monos” which means alone. The earliest monks lived alone as hermits in the wilderness. As more people were drawn to this ascetic life, communities were formed and monasteries built. 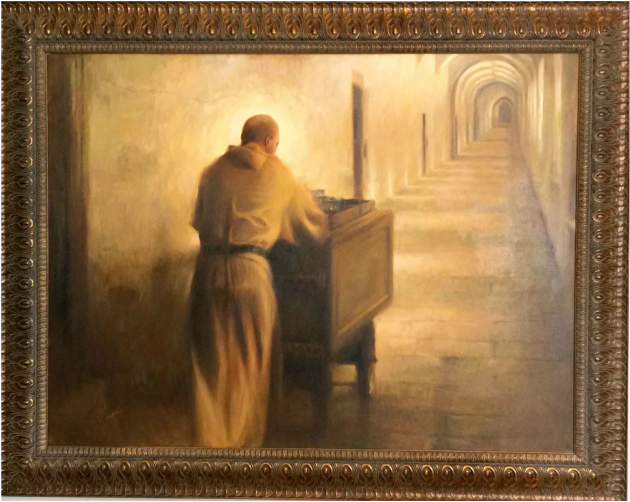 This painting reflects the monk’s singular focus on God in his daily practice of work and prayer. The practice or “ora et labora” is from the Rule of St. Benedict, founder of the order of Benedictans, and means pray and work. St. Benedict viewed prayer and work as partners, and combined contemplation with action.